The SPADE anchor is manufactured in three materials (Steel, Aluminium, and Stainless Steel), and in six sizes. Hi-tensile steel versions are hot-dip galvanised. All SPADE anchors of the same size, regardless of the material they are made of, will work with the same efficiency. You will find all technical data on the appropriate technical details page. We are selling our products direct as well as through a dealers network. Note : Plough shaped anchors are designed to plough the sea floor, as they move through it – hence the name. SPADE anchors by name, and by action, dig deeply into the sea floor. Once they are within the sea floor, the concave shape of SPADE anchors is designed to compact the sea floor, and thus not to move! This design is unique. 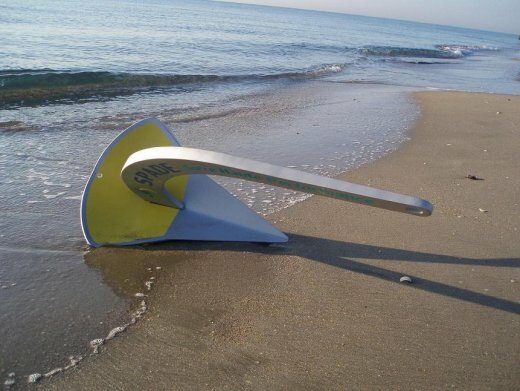 At SPADE we never refer to an anchor’s weight, but rather to its effective surface area. – 1. The anchor must dig in rapidly, regardless of the type of sea bottom. – 2. The anchor must bury itself deeply within the bottom. – 3. Once set, the anchor must give the maximum holding power without dragging. – 4. 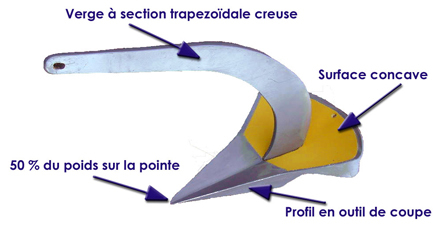 If the traction force exceeds the bottom holding characteristics, the anchor must offer constant, and maximum, resistance to dragging – even if it moves under extreme load. – 5. The anchor must keep on holding, regardless of the shift in direction of either the wind or the current. – 6. The anchor design must not allow the anchor rode to become snagged by the anchor. – 7. The anchor must be built strongly enough to withstand very high loads. There’s no need to worry any more ! We offer a six month, full satisfaction warranty to allow you to check for yourself the efficiency of the SPADE anchor.